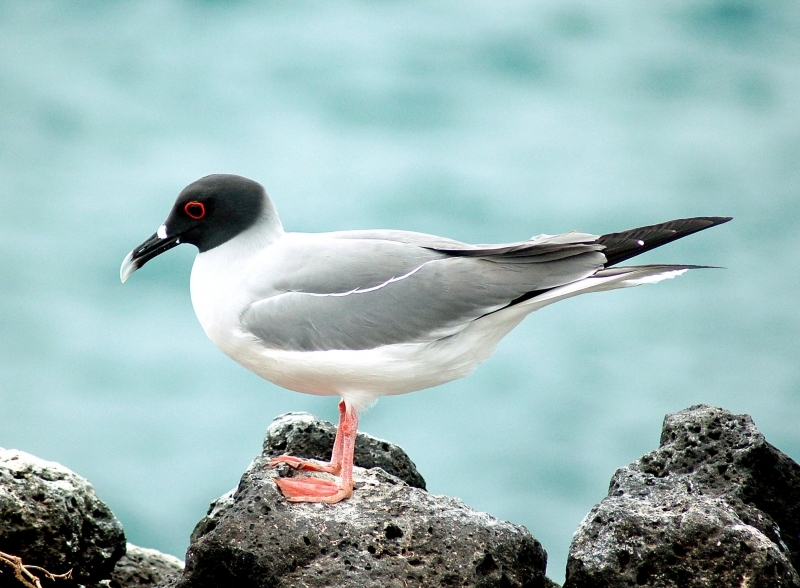 The Swallow-tailed Gull is an equatorial seabird in the gull family Laridae. 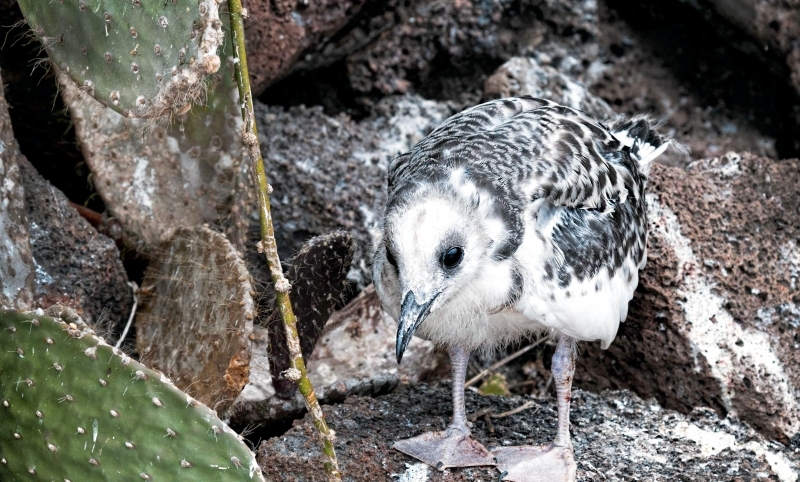 The species is endemic to the Galápagos Islands. 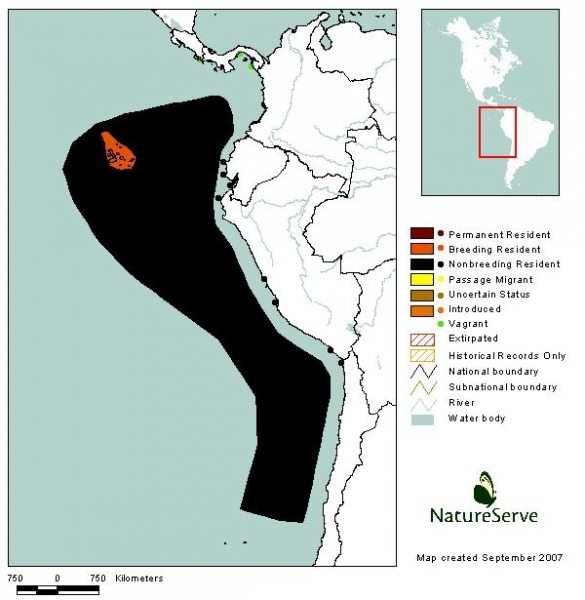 When it is not breeding it is totally pelagic, migrating eastward to the coasts of Ecuador and Peru. 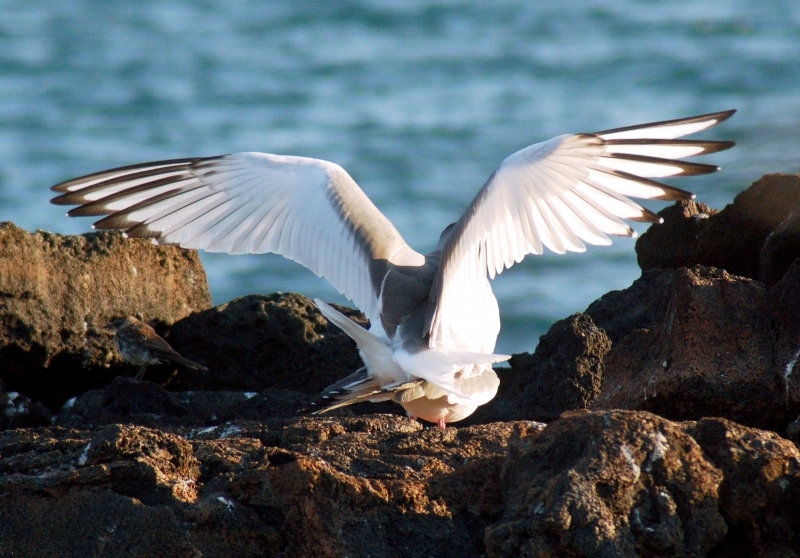 The bird was first described by French naturalist and surgeon Adolphe-Simon Neboux in 1846. 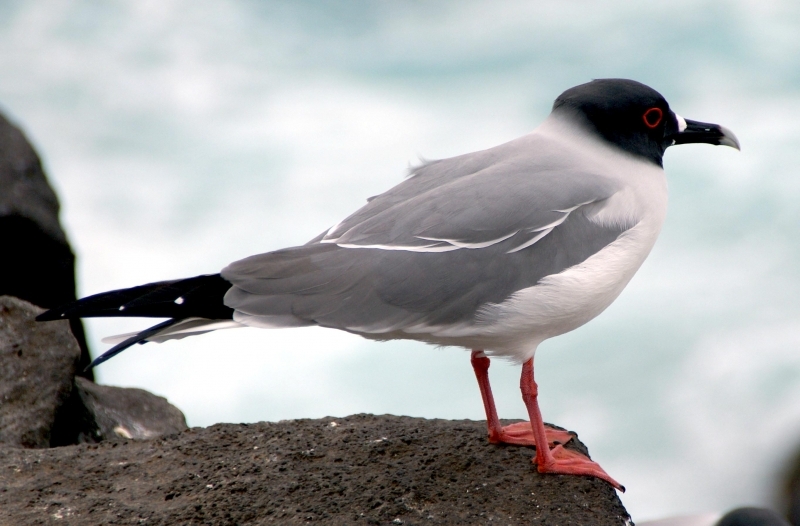 Its scientific name is originally derived from the Greek word for gull, “Glaros” and via latin Larus, “gull” and furca “two-tined fork”. 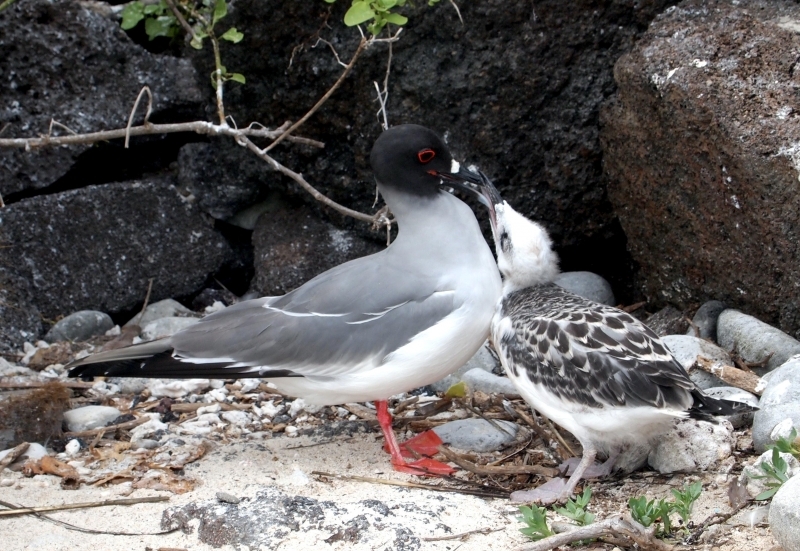 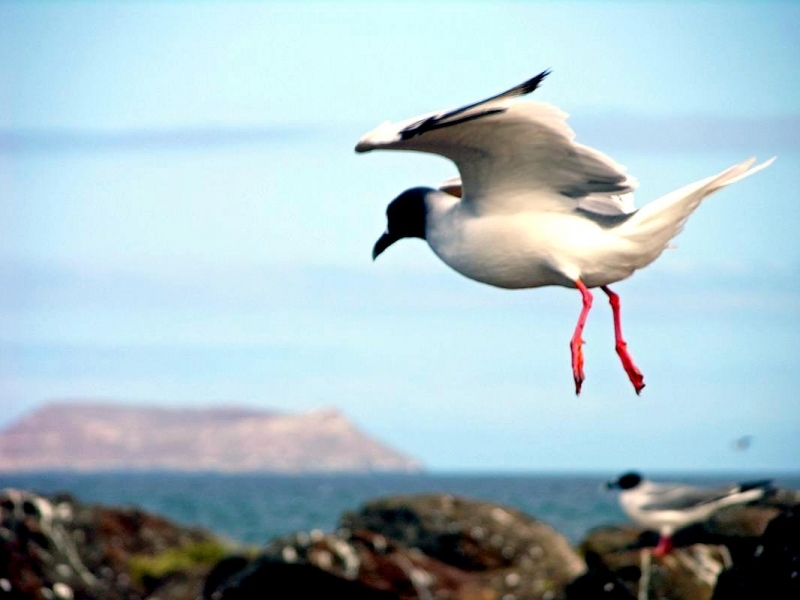 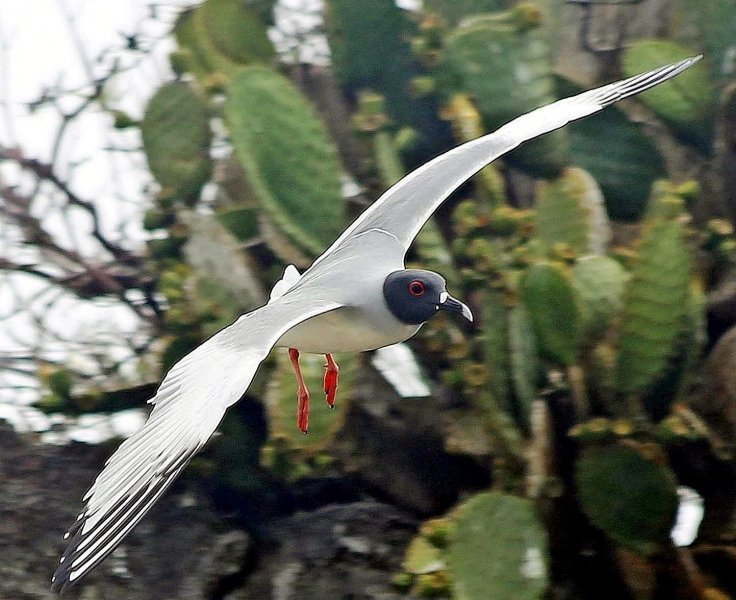 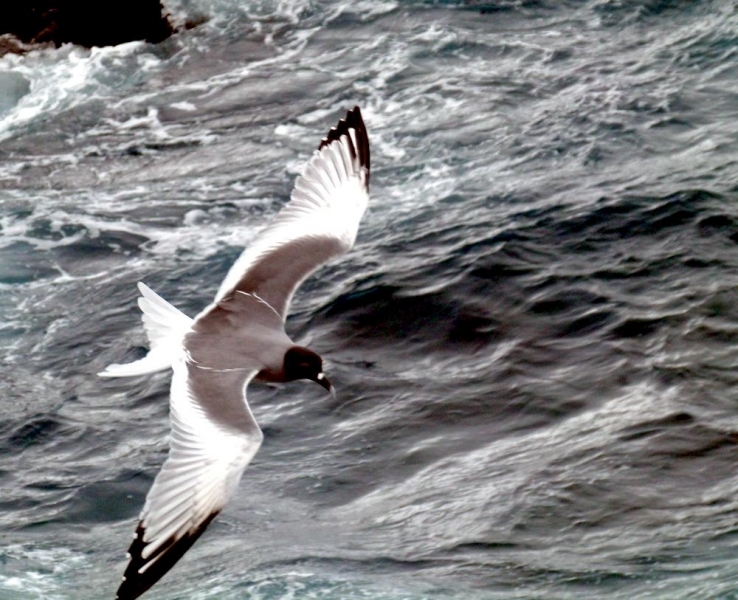 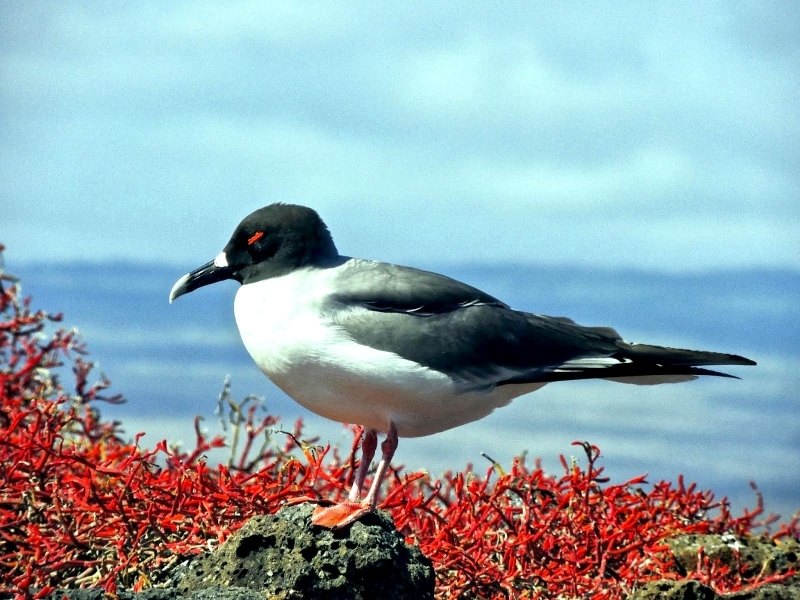 The Swallow-tailed Gull has over fifty colonies spread over the entire Galápagos archipelago. 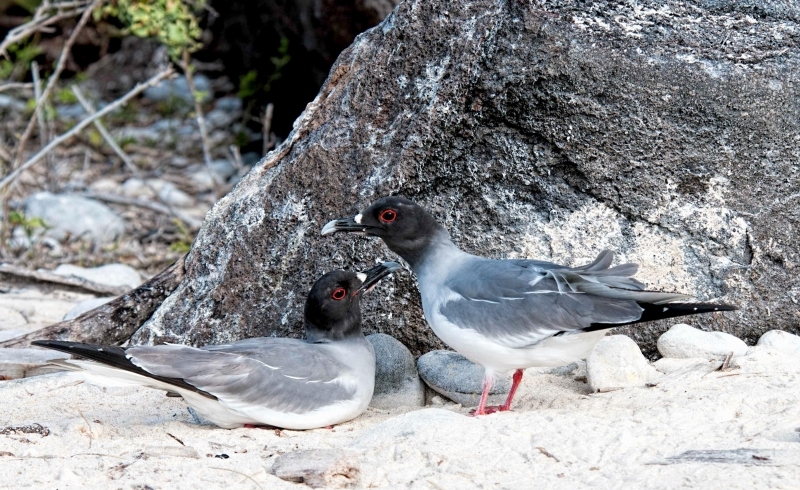 The Swallow-tailed Gull is unique within the gulls for feeding exclusively at night. 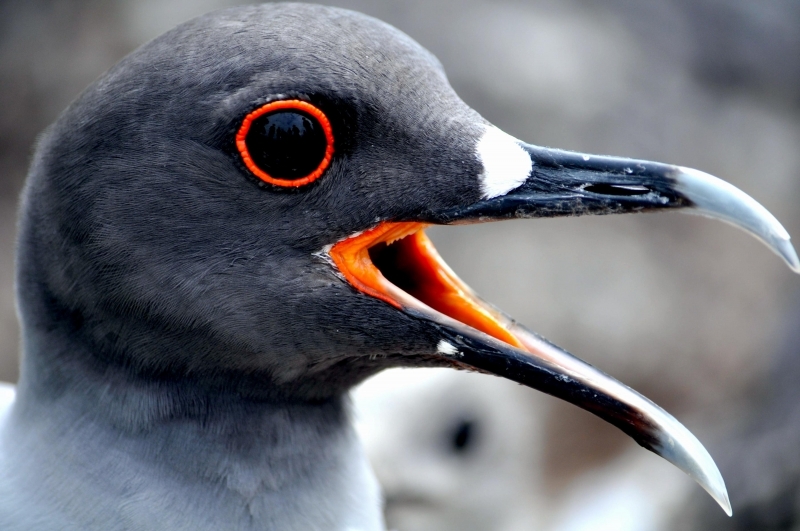 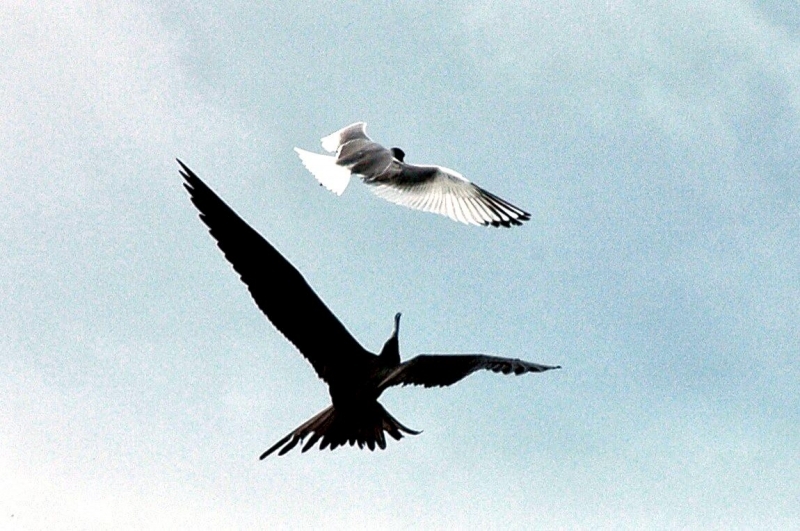 It is the only nocturnal gull in the world. 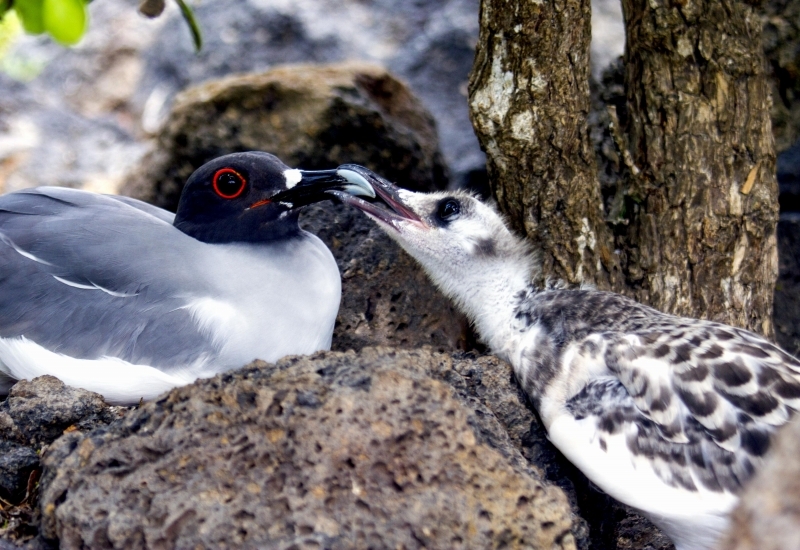 Its night-adapted eyes allow it to feed miles from shore on fish & squid it captures from the surface of the ocean. 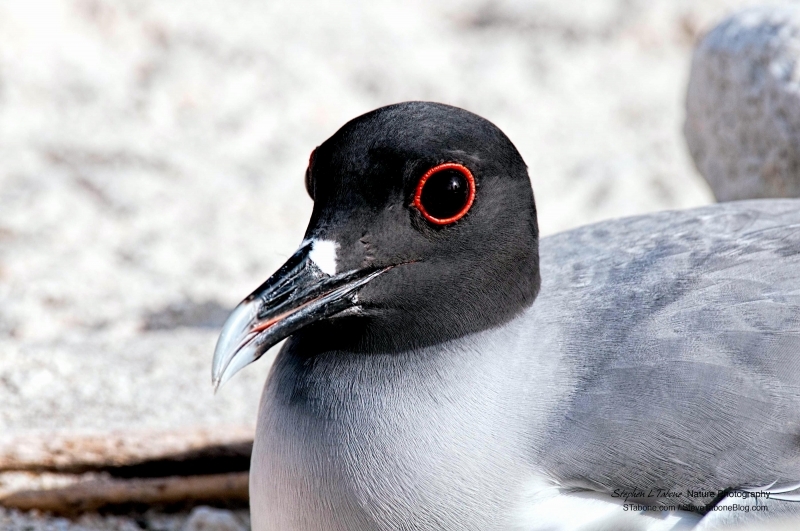 The Swallow-tailed Gull has a very distinctive black head with a red ring around its eye. 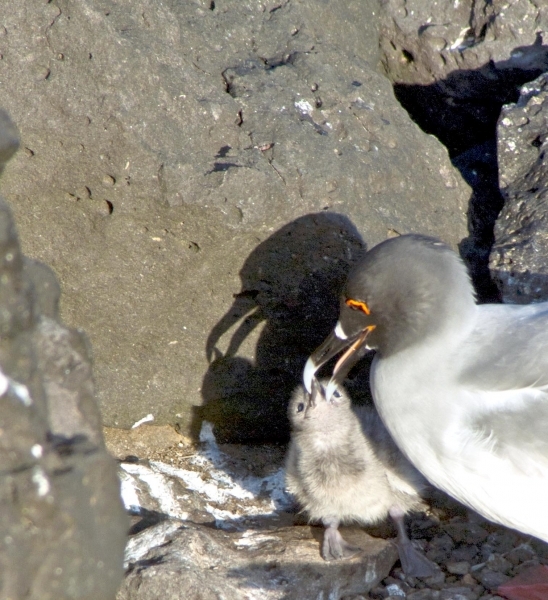 It has a black bill with a gray tip. 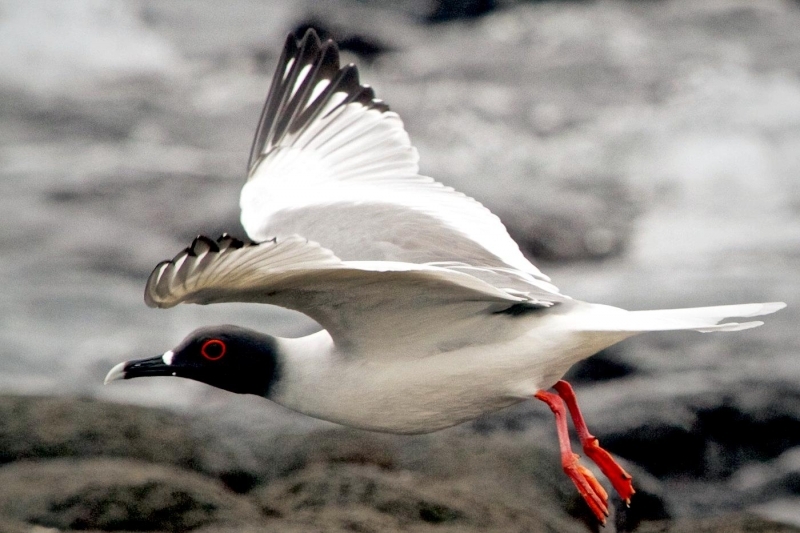 Its forked tail is white and the webbed feet are red. 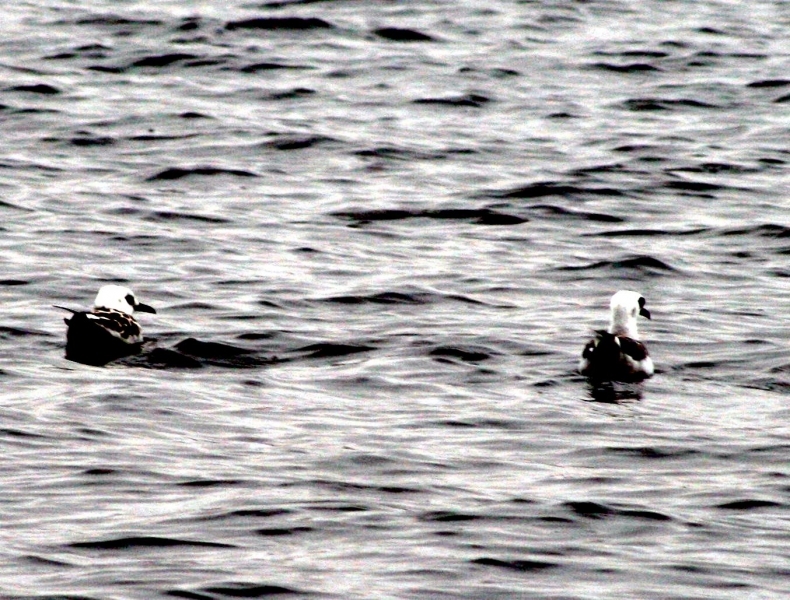 They sometimes have white spots on their backs. 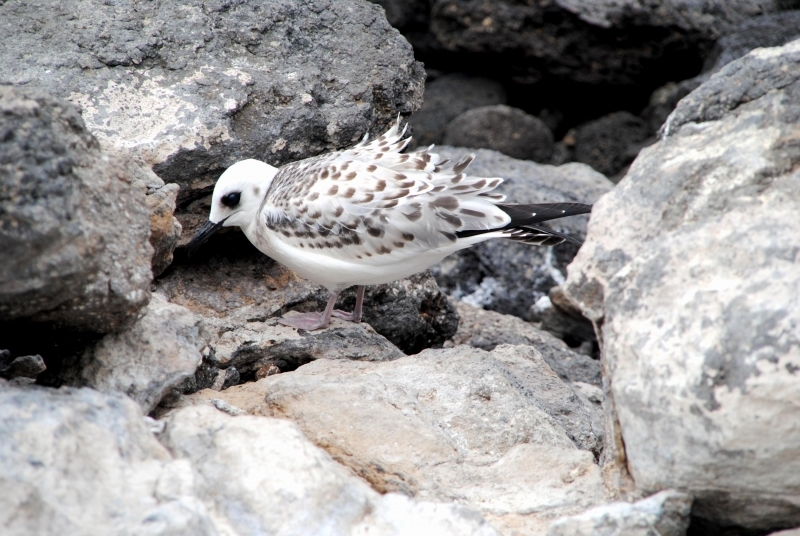 These spots help them camouflage in their rocky cliff habitats. 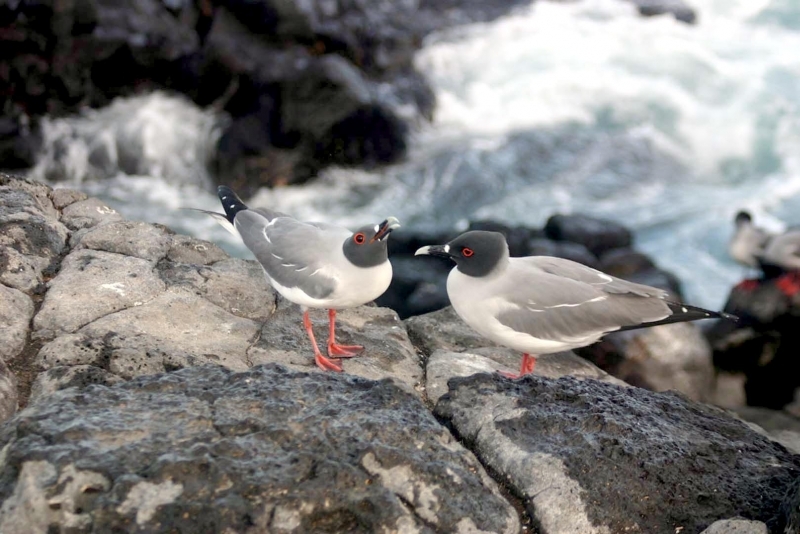 The Swallow-tailed Gull has no structural or plumage differences between the male and female. 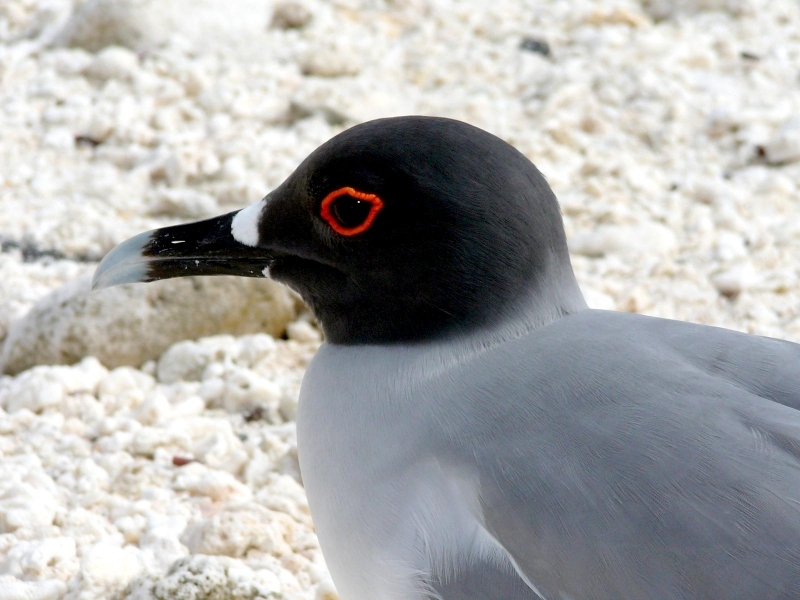 In the breeding season, the adult has a black plumage head and a bright red fleshy rim around each eye. 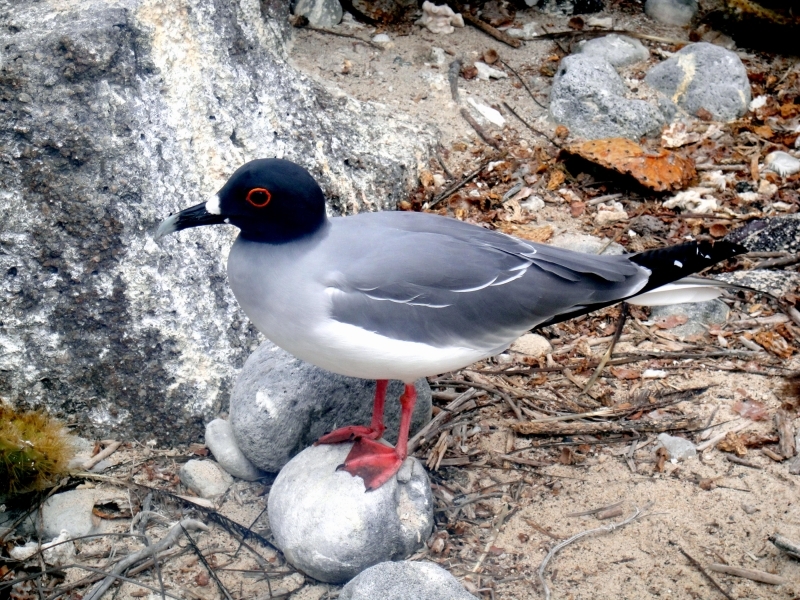 Outside the breeding season, the head is white and the eye rim becomes black. 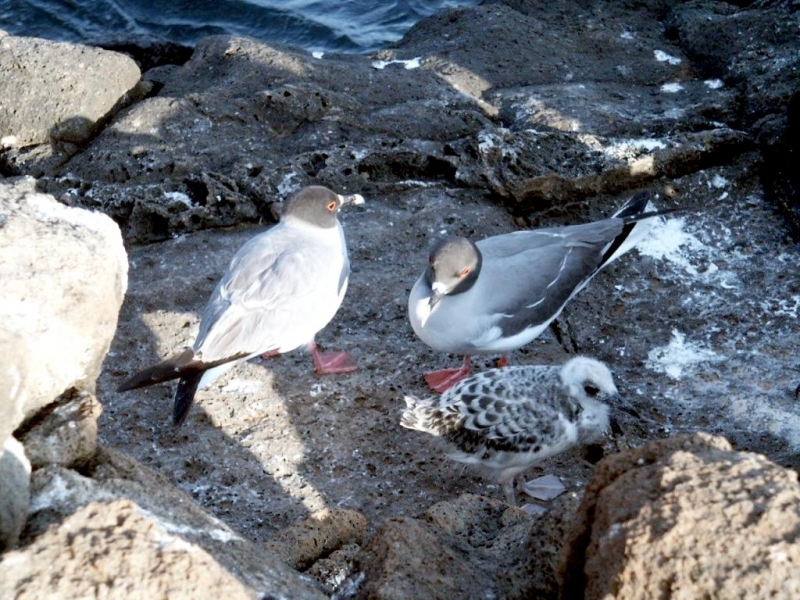 It has a grayish upper breast, gray mantle and black wingtips. 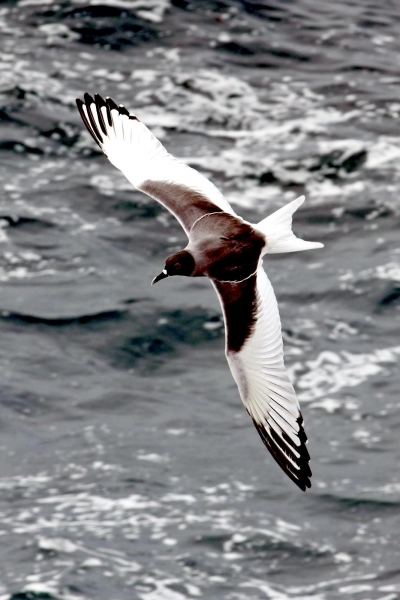 The mostly black bill has a contrasting white tip. 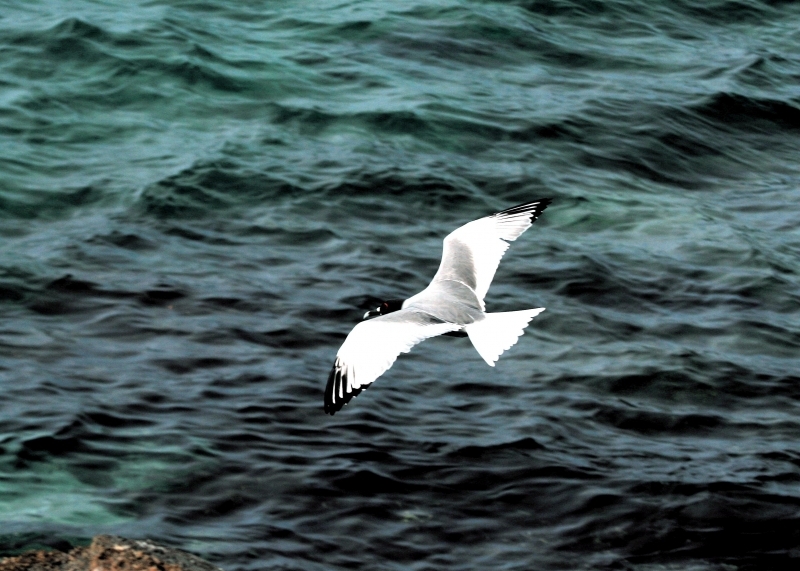 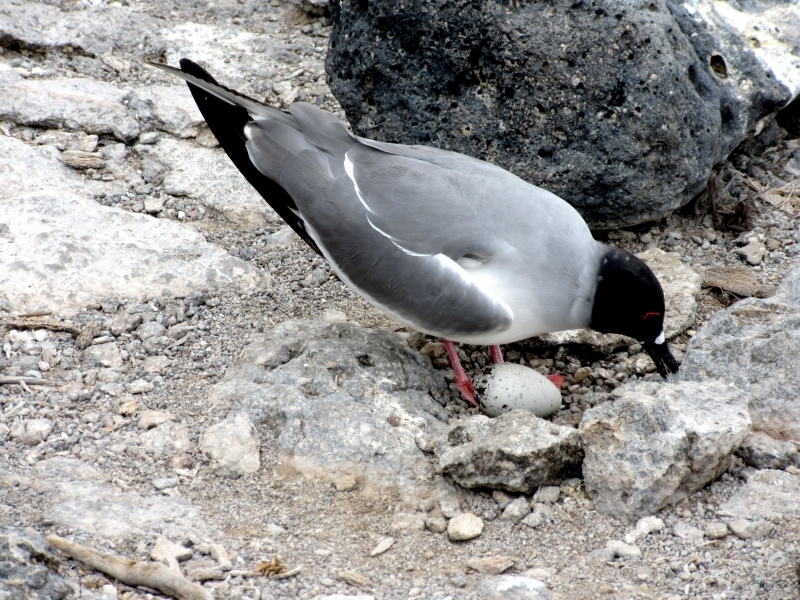 Swallow-tailed Gulls nest in small colonies throughout the year on the eastern side of the archipelago. 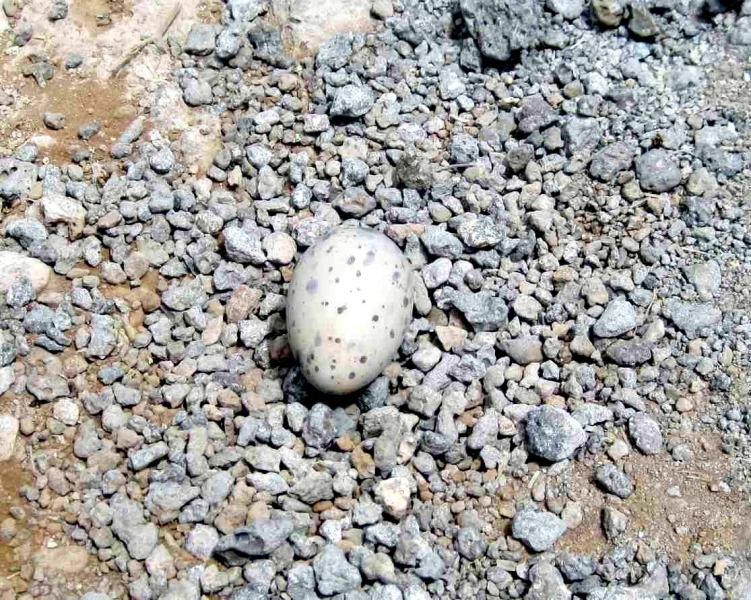 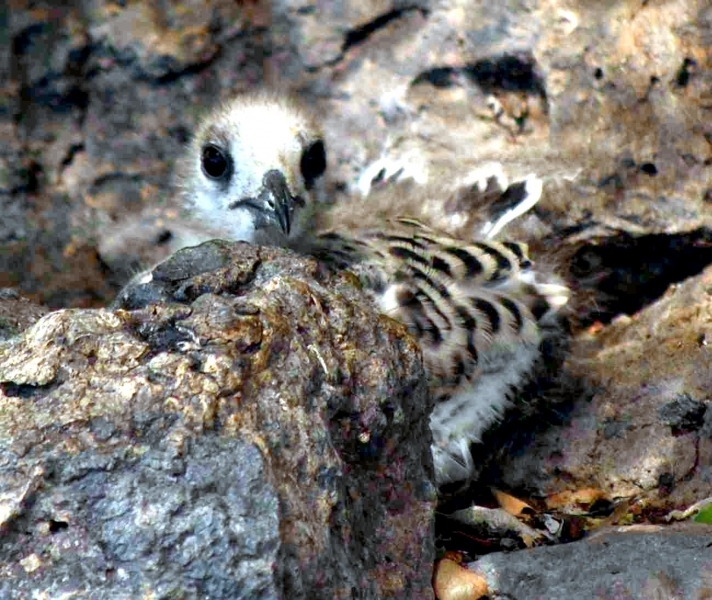 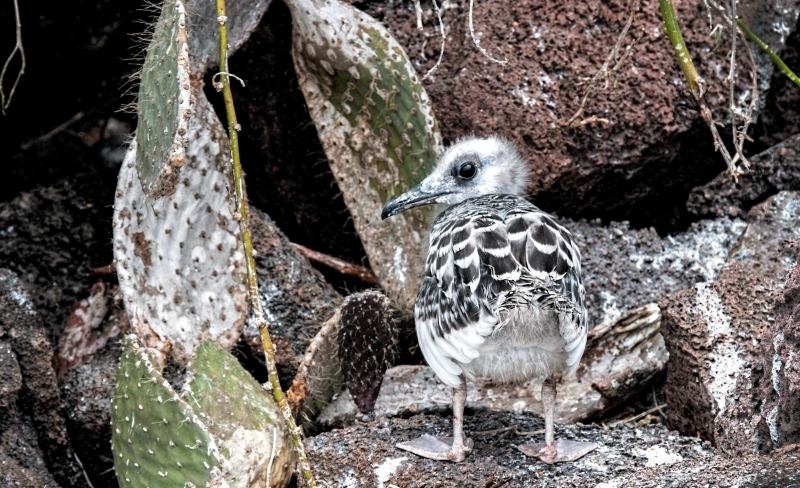 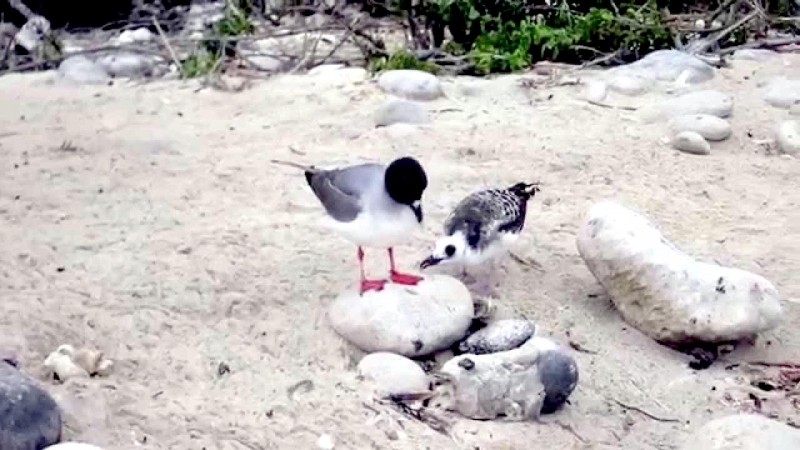 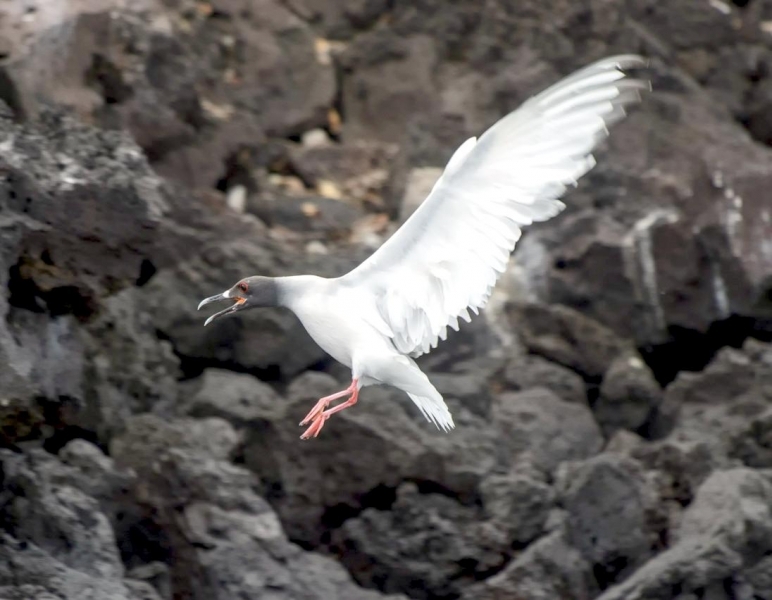 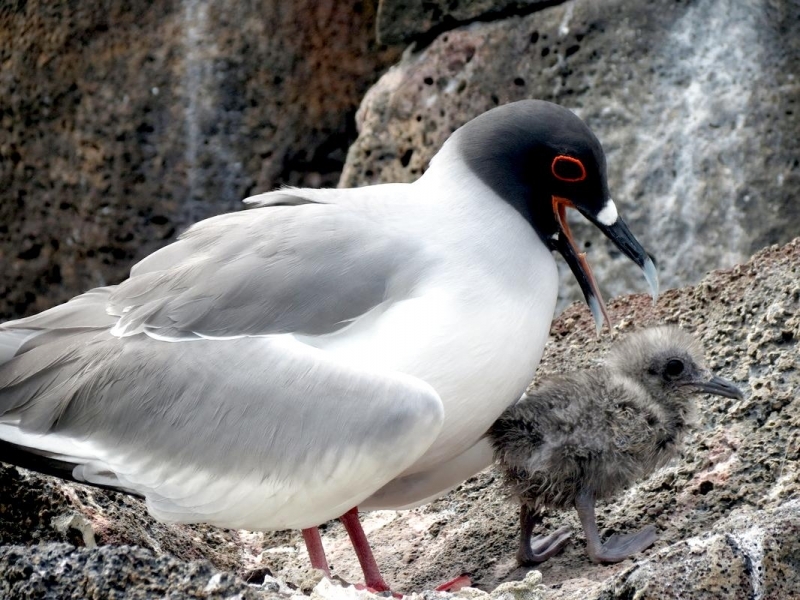 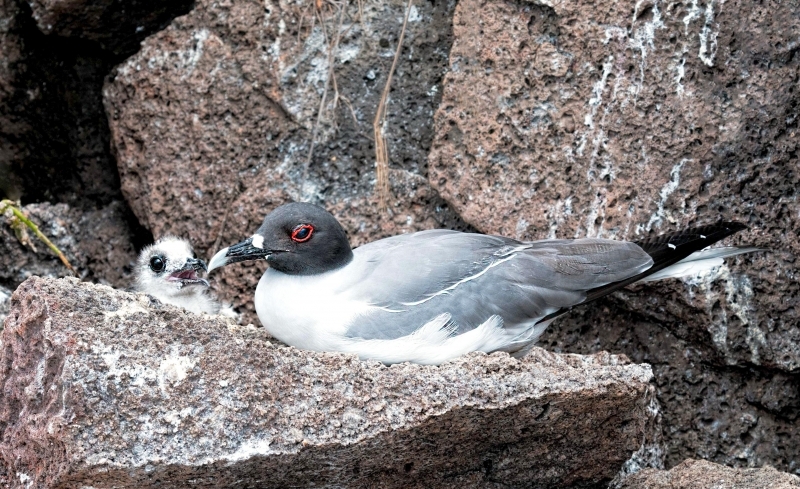 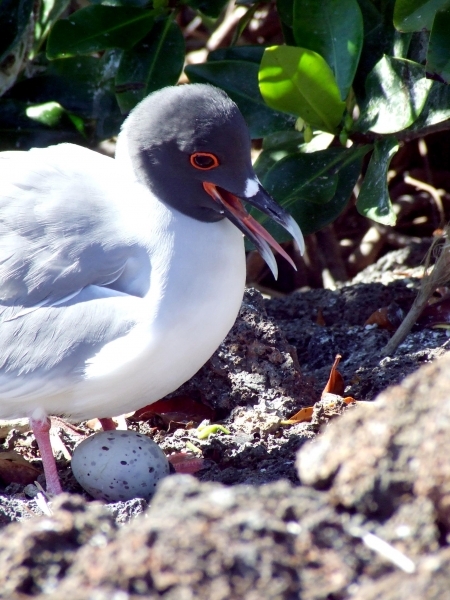 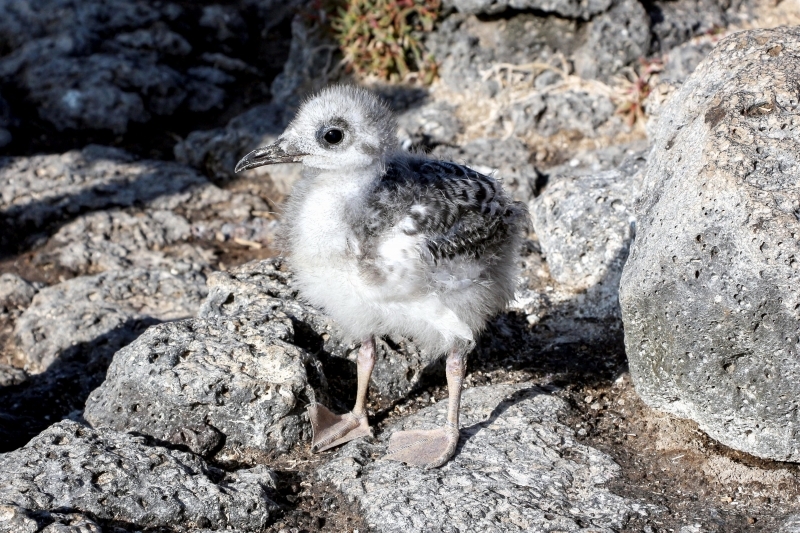 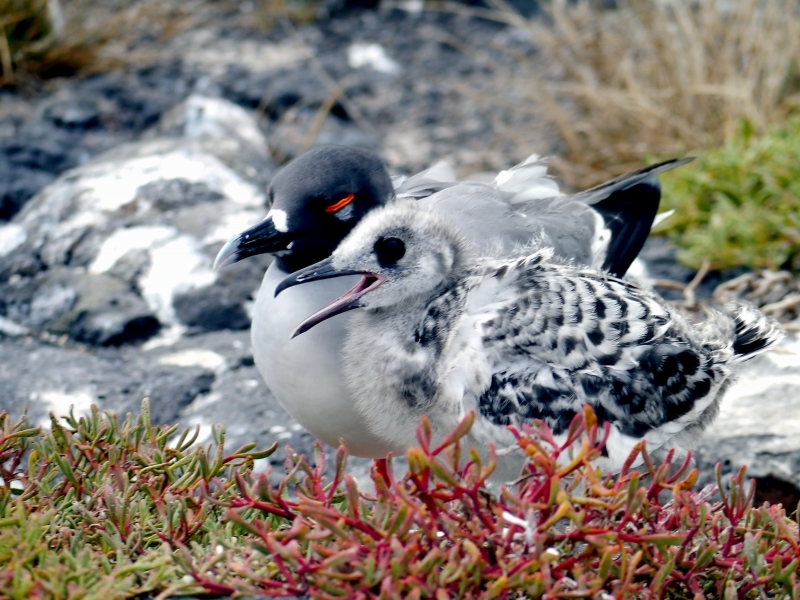 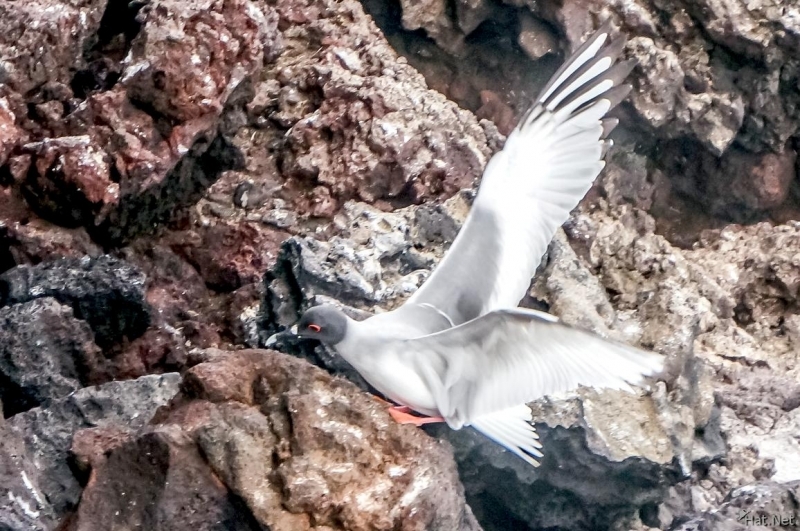 It lays only 1 egg on the cliffs of all the Galápagos Islands except Fernandina and Isabela and its chick is the only chick with so much white, perhaps so that the returning parents can find them more easily. 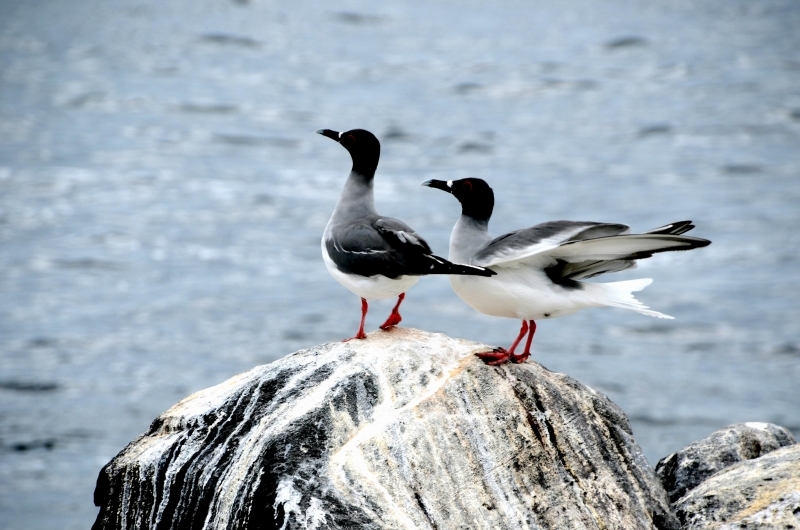 The immature gulls also have brown spots on their backs and a black band on their tails. 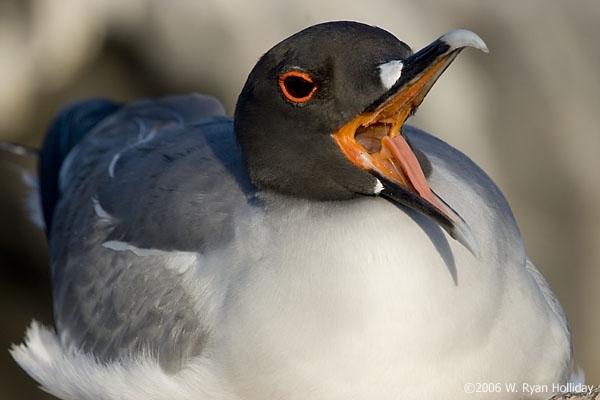 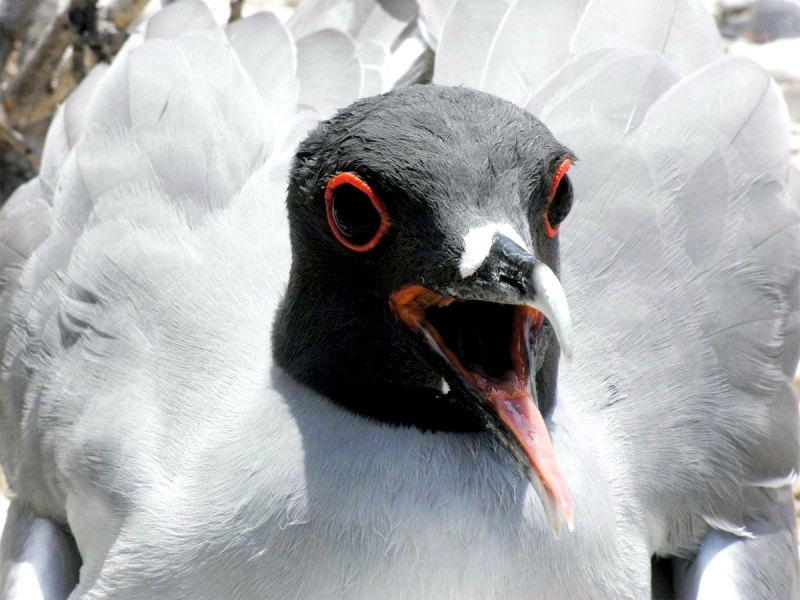 Immature Swallow-tailed Gulls have a harsh call with an initial scream that displays their red gape and tongue, a rattle and ending with a clicking sound. 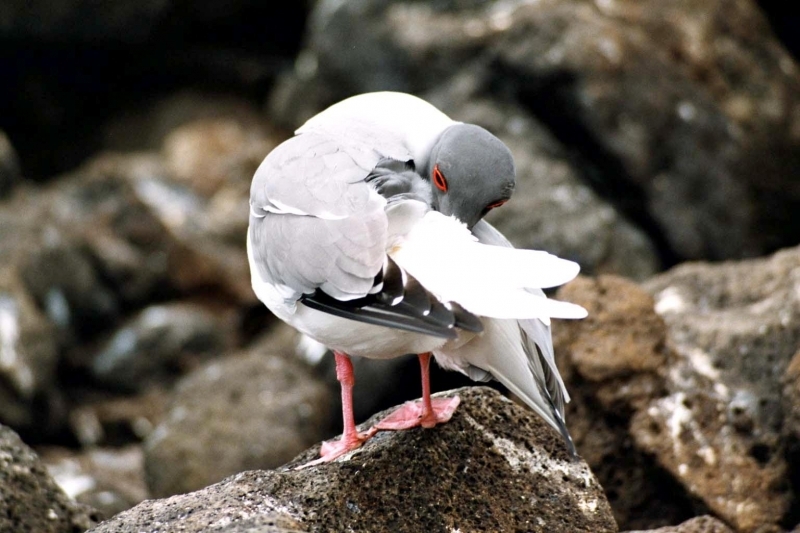 Courtships involves preening, head-tossing and regurgitation of food by the males. 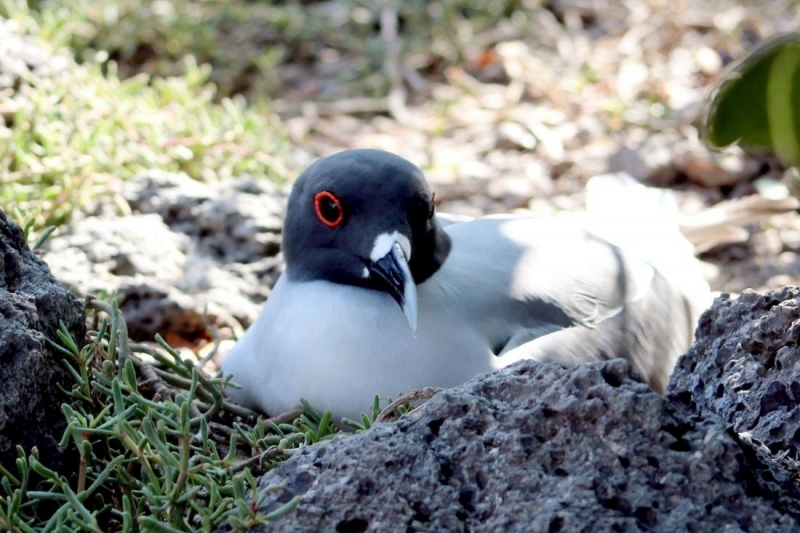 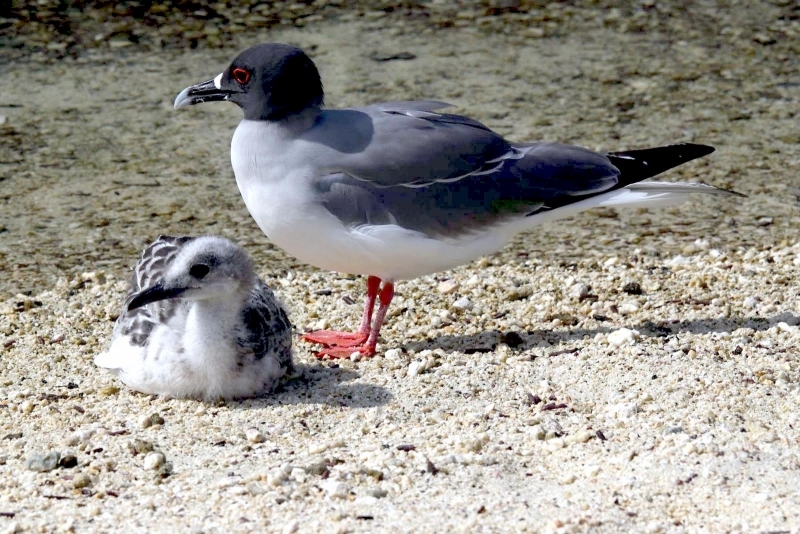 Swallow-tailed Gulls can nest at any time of the year, “winter” is not well defined for it, but most birds disperse during October-February.